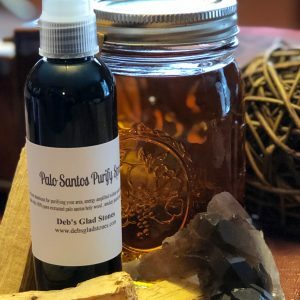 View cart “PALO SANTOS PURIFY SPRAY” has been added to your cart. I extract patchouli for 6 weeks add smoky quartz gem elixir and clear quartz chips to amplify. Patchouli aroma has an almost immediate effect of grounding; it encourages the release of serotonin and dopamine which naturally ease the feelings of anger anxiety and anxiousness I incorporated an intentional way to ease your aura. Peaceful Patchouli Spray eases out unwanted feelings with an earthy aroma and smoky quartz gem elixir is an added grounding bonus!